Should Safety Glasses Be Worn Under Faceshields? When it comes to handling hazardous chemicals, workers need the proper equipment to stay safe. Protecting a worker’s face and head should be an employer’s top priority. And while many businesses supply safety equipment, it’s not always used in the right way. A faceshield doesn’t provide the coverage necessary to prevent injury 100 percent of the time. Workers need to wear personal protective equipment (PPE) that protects both the eyes and the face from injury. A faceshield alone doesn’t always guarantee safety. Learn how safety glasses or goggles and faceshields can work together to provide the best protection possible in hazardous situations. 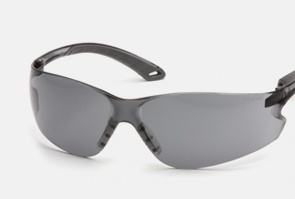 Standard safety glasses are designed to protect against injuries associated with regular eye hazards. This includes falling particles and impact hazards. When working with liquid splashes or dry particle hazards, consider how much more painful it would be to have that affect the eyes than the body. If work operations present dangers that can cause injury to the face or there is a risk of a chemical splash, both the eyes and the face should be shielded. (Note: OSHA does allow the use of indirect vent goggles for chemical splash hazards without the use of a faceshield). A common problem occurs when workers use a faceshield as their primary means of impact protection. 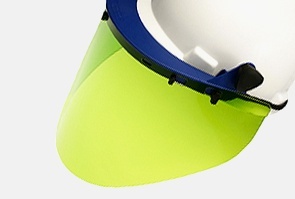 A faceshield is typically designed as secondary impact protection for a worker’s eyes. That means workers can be at risk for injury by not wearing safety glasses or goggles beneath a faceshield. A faceshield will always have significant gaps on either the side or bottom of the lens, allowing potential flying debris to deflect off your clothing or body and enter under the shield – potentially getting to the eyes. If that potential danger is serious enough, the employee needs to closely consider how tight the safety glasses sit on their face under the faceshield or simply step up to wearing goggles under the faceshield. Most faceshield manufacturers explain that their products are not designed to be used for impact protection in lieu of protective eyewear. Instead, use faceshields in conjunction with safety glasses or goggles specifically designed to protect the eyes. The PPE standards from the Occupational Safety and Health Administration (OSHA) discuss the differences between primary and secondary levels of impact protection. OSHA confirms that faceshields should be considered secondary protection from impact hazards. If you have questions on what standards apply to your workplace, review the PPE guidelines. OSHA requirements for eye protection can be found in 1910.133 for general industry workplaces, 1926.102 for construction sites, and 1915.153 for shipyard employment. Remember, OSHA always views faceshields as a secondary protection. You must have safety glasses or goggles under them no matter the situation. Glasses, goggles and faceshields all offer different safety benefits. It’s important to distinguish between the level of safety each type of equipment offers. Doing so ensures that workers’ eyes and faces will be properly protected from hazards in the workplace. Protect your eyes with a variety of safety glasses equipped to protect against industrial hazards. Stay safe from dust, debris and chemicals with our line of faceshields and visors.